What are the best skirts for petite women? In my petites shop, I constantly get requests about petite pants, and much less about with skirts. Does that mean finding the right skirts for petites are easier? Not really. Since I am 5’2″, I have gone through all kinds of frustration when searching for that perfect skirt. I suppose most of you understand what I’m talking about. If you go to the department store, what is supposed to be a mini skirt may be over the knee on a short person, and what is supposed to be a knee length pencil skirt becomes a midi skirt! Don’t even mention maxi skirts. They were similar to the train of my wedding dress. Have you had those moments when you are just like “all right, am I just wasting my time here?” You are not alone. True. Skirts don’t have inseam, so it might seem like you can always find skirts that don’t require hemming. However, just that you can pull it on doesn’t mean it looks good on you. That is why I came up with the hacks and tricks that will make a skirt outfit look good on petites. This is the number one on our list of best skirts for petites. High waisted skirts are a perfect piece to elevate your waist line, and improve the proportion of your body. The key of wearing a high waisted skirt is to tuck in your top, so that your legs will look longer than they are. High waisted skirts also have the flare of retro style, which is quite hot in today’s fashion trends. Another bonus of wearing high waisted skirt is it can also make your stomach look flat, which is what every body type would appreciate regardless if you are petite or not. Since high waisted style has more fabrics around the waist area, you should be careful about the colors and patterns you choose. Darker color and simple prints or patterns are universally flattering. If you are petite plus, you want to avoid colors that are too bright or patterns that are too busy, as they will only catch people’s attention around your tummy area. When picking out the best skirts for petites, one general guideline for women under 5’4″ is to go with skirts 3-4 inches above your knee. However, for high waisted style, you do not have to be restricted by this rule. Because your waistline is significantly lifted by the skirt, you can opt for knee length and your legs will still look elongated. A line skirts are on the top list of best skirts for petites because they are universally flattering, regardless of your body type. The shape is clean and the slight flare makes your legs look more slender. 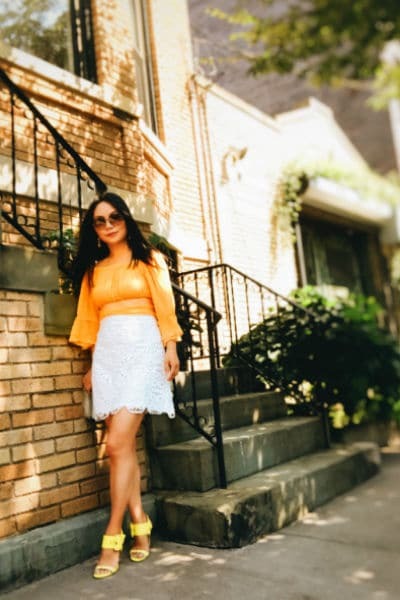 If you re a petite pear shape who is self conscious about your prominent thighs and hips, A line skirts are your best friend because you do not have to worry about drawing attention to those area. If you happen to be a petite inverted triangle shape, A line skirt balance out your broad shoulders. If you are a petite rectangle shape and your goal is to create curves through your outfit, go with A line skirts with ruffles. I am a petite apple shape and my area of concern is my stomach, I love A line skirts because the flare camouflage my mid riff and I do not have to worry about showing my mid section like in a pencil skirt. The best length for petite women is slightly above the knee or at the knee. Because of the A line shape, if you are wearing a very short skirt and want to avoid showing your undies, make sure it is a skort. This one goes without saying. As a short girl, you NEED mini skirts. If you don’t own a lot of them already, please, please add some to your wardrobe. Mini skirts are the easiest to style for a short person and make her legs look super long, instantly. What is the ideal length for you? 5 inches above your knee is perfect. That is the classic mini skirt length without looking trashy. Pair them with tall boots in the fall and winter for an easy and fashionable look. Add a long coat when the weather gets chilly and you are good to go. Talking about the best skirts for petites, we have to talk about maxi skirts, even though this sounds a bit counterintuitive on the surface. Don’t all the fashion books and stylists teach us wearing a skirt above or at the knee is best style for short women? Yes, short skirts definitely is one of the most obvious ways to lengthen your legs and look taller than you are. However, if you do the opposite, i,. wearing a really long skirt, it could also work very well for petite women. I am talking about maxi skirts that reach (almost) your ankles. Is it surprising to you they are very flattering to petite women? If you wonder why, here is the reason: petite women needs length in their style in order to look taller. Maxi skirts and skirts create that long column of colors which vertically lengthens and thus makes petite girls look taller. The best example is Nicole Richie, whose signature style is maxi dresses and maxi skirts. Can you tell she is only 5’1″? Maxi dresses and maxi skirts have been trendy for almost a decade now, and they are a summer favorite of many “IT” girls. They are so easy to wear in the summer time for so many reasons. 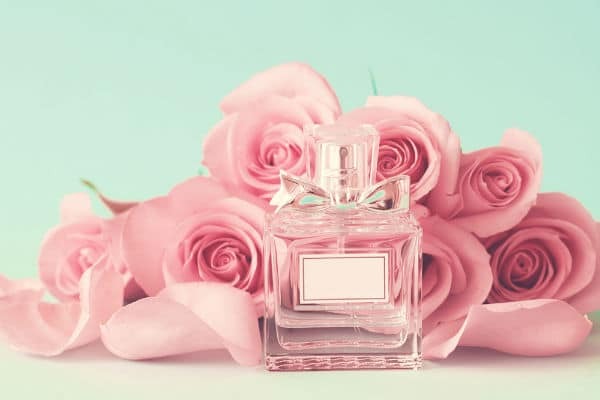 If you are packing for a resort vacation or going to a beach wedding, they are probably your best bet. They are so comfortable you can just throw them on and wear them and hang by the beach or the pool all day. They are also very forgiving and you can save on razor time, to state the obvious. For petite girls, another bonus is you can wear wedges under it and look great and feel comfortable. In general, we advise petite women to be cautious about wearing chunky shoes such as wedges, as the bulkiness is not very flattering on a smaller frame. However, since your legs and feet are almost fully covered when wearing a maxi skirt, paring it with wedges actually balance it out and they give you an instant lift of 4 inches and all day comfort. To avoid looking buried by the fabrics, the best style of maxi skirts for short women is the one with slit. 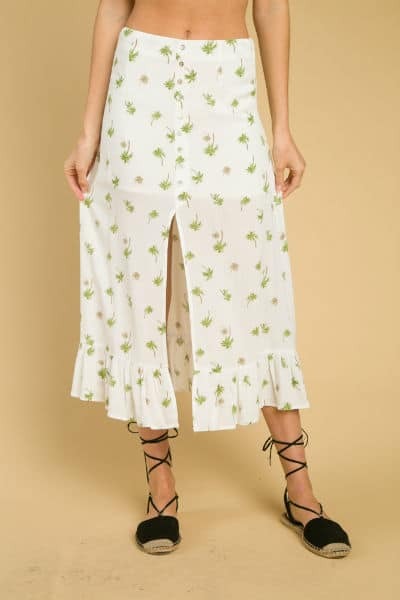 This Lillie petite maxi skirts at Petite Dressing boutique has a front slit, which not only makes it easier for you to walk, but also makes your legs look longer by showing some skin (especially when you are walking). As seen on Vanessa Hudgens (5’2″). The best way for a short girl to wear maxi skirts is to pair it with a crop top. Doing so will double the leg lengthening effect of the maxi skirt by further shifting the focus up. Plus, since maxi skirts already have so much fabrics, a crop top will balance it out and will not make you look like being worn by the clothing. If you are under 5’4, the regular size maxi skirts will probably be dragging on the floor for you. To find the best maxi skirts for petite women, picking out the right length is critical. You need to make sure to get it in the length that works with the shoes you have in mind. Do you plan to wear it with flats? Or with heels? The best length could be quite different. When maxi dresses and skirts first became a summer trend, they were only available in regular sizes, so the only way a short girl could pull it off was to first send it the tailors and cut off the extra inches. 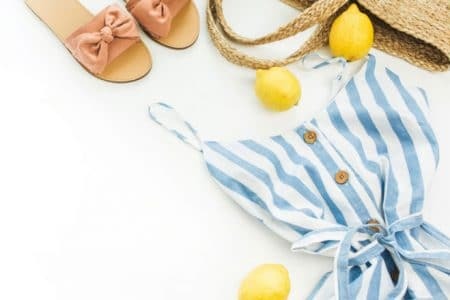 After so many summers, now more and more brands (ASOS, London Times, Reformation, Anthropologie, etc) are making petite size maxi skirts at all kinds of length as well as price level, and we do not have to worry about alteration any more. Maxi skirts are available in all kinds of prints and patterns and they are normally inexpensive, so you should definitely try different colors and have fun with them. For petite girls, you should avoid maxi skirts too long and be very careful when you walk, as there is a risk of stumbling on it and fall. 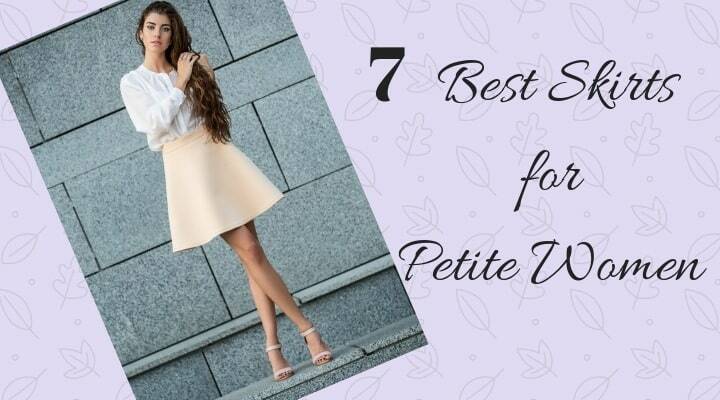 The best skirts for petite women should have some vertical designs that draw eyes up and down and create the illusion of length for your legs. Don’t worry, that doesn’t mean you have to wear zebra prints. There are many other prints that are more subtle and achieve the same effect of lengthening. For instance, grey stripes on navy or black background could be very flattering to short women who want their bottom half to look smaller (like the petite pear shape). When picking out prints, make sure they are not too busy or too loud. Otherwise they might make you look like drawn by the fabric. One rule of thumb for short women to find the best patterns is to go with the “rule of fist”. That is, the print should be in proportion to your body size and should not be bigger than the size of your fist. Being proportional is key, and that does not mean petite women should all wear tiny prints. If you are petite and skinny, sure, wear small prints by all means. If you happen to be short and curvy, then tiny prints might do the opposite for you (make you look even bigger by contrast). Going with a medium size print is your best bet. Also, this vertical preference is not restricted to just prints- you can also look for vertical designs (such as side zipper, etc) which are equally flattering for petite women. Besides the traditional silhouette of best skirts for petite women, skirts with asymmetrical hem can also work out very well on short women. It can be short hem in the front (above or at the knee) and longer hem in the back (reaching your mid calf), which looks like a mini skirt in the front and a midi skirt in the back. This kind of skirts are fun to wear, and they can also change the proportion of a short person because of the uneven hemlines. Another example is slanted hemline with ruffles, which is similar to a vertical line design. As mentioned earlier, any vertical line in your outfit will help to create the illusion of height, thus is great for short women. So if you have never tried uneven hems, be sure to try them on and they could be a very pleasant surprise for you. Since we are on the topic of best skirts for petite women, a lot of you might ask if midi skirts are off limits. Well, it depends. 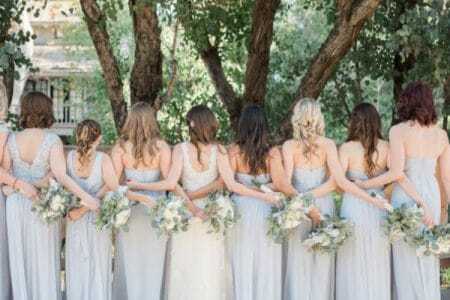 Generally speaking, midi length is the hardest length for petite women to pull off. The reason is simple- it ends at an awkward length at your calves between your knees and your ankles, so there is a big risk that your legs could look cut off. Also, one general rule is we should want the hem to be where we want people to notice the most, because the hem draws people’s attention there. Very few people want to the focus to be on their calves! Regardless the height, it is easy for midi skirts to make your calves look bigger than they are. Does that mean petite women should stay away from midi skirts for good? Nothing in fashion is absolute. If midi skirts have slide slit, that changes the balance point of the look and will have a totally different visual effect. When you are walking or sitting down, the side slit shows some skin of your legs, which will make your legs look longer than they are and you will not look like drowning in fabrics.